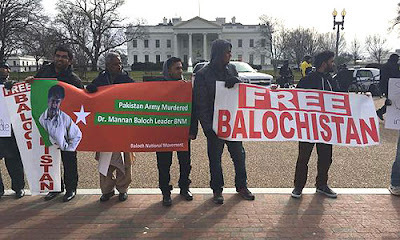 Demanding an end to Pakistan's ‘forceful’ occupation of Balochistan, Baloch-Americans and leaders from the restive Pakistani province held a peaceful protest in front of the White House to seek US intervention and deployment of NATO troops in the region. "At least 35,000 Baloch are missing. There is a grave violation of human rights on the people of Balochistan and all this is being perpetrated by the Pakistan Army and the ISI,” Mama Abdul Qadir Baloch said yesterday in front of the White House. Vice-president of the Voice for Baloch Missing Person, Qadir Baloch who came from Pakistan to attend this peaceful protest in front of the White House had carried out a 3,000 km long march from Quetta to Islamabad in 2013 against human rights violations in the province. “We urge US President Barack Obama to ask the Pakistani Government to immediately stop human rights violations against the people of Balochistan. We also urge US to send NATO forces in Balochistan to save its people from the atrocities perpetrated by the Pakistan Army on us," he said. They also called for a free and independent Balochistan that can guarantee peace and stability in the region plagued by religious extremism.